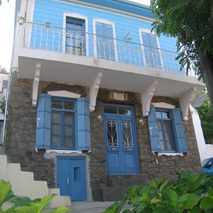 Atzanos Traditional Houses occupy a two storey stone-built, wood-clad, heritage property originally built in 1925. They are located in Chora, just 5 km from the harbour. Chora (also known as Samothraki) has been designated a traditional settlement. It is the capital of the enchanting island of Samothraki, an island of unparalleled natural beauty in the north-east Aegean of Greece. The house stands, as if hanging from the pine forest, on the slopes of mount Saos which surrounds the amphitheatrically built Chora. It is tucked away in one of the many picturesque cobbled streets, gazing at the deep blue Aegean Sea; on its right the ruins of the medieval tower of the Gatteluzi (1300-1400) and on its left the church of Koimiseos of Theotokou (1875) and the Folk museum.